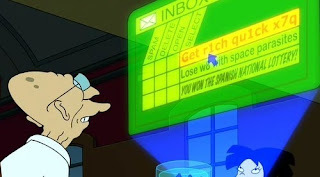 Picked up at Lifehacker.com, it's The Complete Guide to Avoiding Online Scams (for Your Less Savvy Friends and Relatives). Now, this list does not specifically address the biggest scams on Kijiji. Those'd be the people selling big-ticket items at stupidly low prices from locations you can't get to. They say they're eager to ship it to you, though, so just pay them through Paypal/Western Union/etc. Yeah, be smarter than that.